I'll readily confess that I am a serious seasoning freak. I have more kinds of various seasonings than should be allowed by law. However, I really have a weakness for barbecue seasonings, so when Mike Trump from Oakridge BBQ was kind enough to send me some rubs to try I welcomed the opportunity. 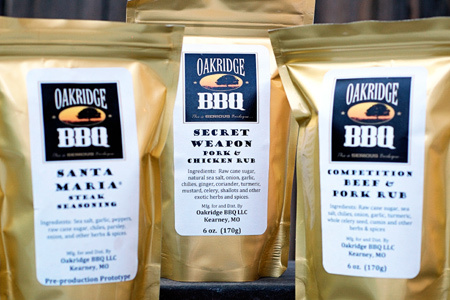 The Oakridge BBQ company is based in Kearney, Missouri, near the barbecue mecca of Kansas Ciy. They grew the company out of an award-winning competition team that began in 2002. Among other awards, they hold a coveted perfect 180 score in pork ribs. Having competed for a few years myself, I can tell you that that is a huge accomplishment. When I received the rubs I was immediately intrigued by their gold packaging. Rather than the ubiquitous shaker bottle, they package their rubs in high-quality multi-layer resealable bags. Spices are highly susceptible to air and light exposure, so this packaging really helps to keep the product fresh to your door, and between uses. Speaking of freshness, that's one of the very first things that came across the moment that I tasted the rubs. The flavors explode on your palette and immediately scream "fresh and quality". Their rubs are blended by hand in small batches and boast 100% natural indredients, with no MSG, no fillers, no preservatives, and no anti-caking ingredients. Oh, and all of their rubs are USDA-qualified as low-sodium products. I tried three of their rubs (Competition Beef & Pork Rub, Secret Weapon™ Pork & Chicken Rub, and their new Santa Maria Steak Seasoning), and they all were simply outstanding. Each has a unique flavor profile, but they all have a familiar base flavor with a great balance of sweet, savory, and spice. I even used the Santa Maria Steak Seasoning on a barbecued prime rib roast to rave reviews. Their Secret Weapon™ is exactly that. If you are looking for some seriously fresh hand-crafted quality rubs that are far from the same old same old, order some Oakridge rubs and thank me later. I am glad you have witnessed what I learned about a year ago. These rubs are simply the best, no need to buy anything else! I just had breakfast and am already hungry for BBQ. Rubs are they way to go!